Did you ever get to go to the farm when you were a kid? Farm animals have always gained the attention of little kids and if us adults weren't so distracted we'd probably love to watch those farm animals too. Remember how excited you would get? At first, you'd get out of the car and smell that unmistakable farm smell, yes, the manure is there but then there's that fresh hay, cut grass, and mud smell and you felt a rush of excitement, yep you were going to get to watch some animals. Maybe you were greeted by a couple sleepy farm dogs and you could have even seen some chickens and geese hovering by the barn. One of the best parts of visiting the farm was watching the pigs. Maybe you liked it because you were a kid and they seemed so delighted to root around in the mud. Maybe you enjoyed their deep grunts and squeals. Either way, it's understandable if you brought that swine love into your adult life. Whether you want an easy way to get that piggy look for a costumed event or you're looking for a mascot for your butcher shop. 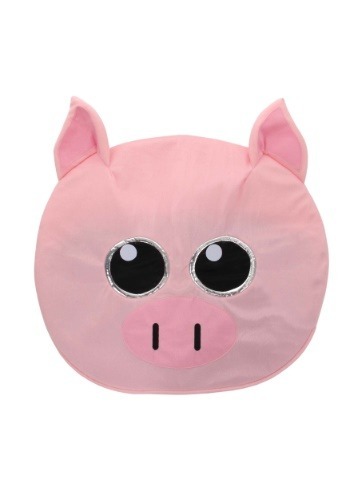 And yeah, it would be weird if you wore it while visiting those pigs you liked as a kid but you know, to each your own.